We were coming off another anti-climactic New Year’s Eve and trying to make the best of our winter break before our last semester of college. It seemed like any other January first, but I knew that night held something bigger–something that would change our lives forever. That evening–just according to plan–we found ourselves in Our Lady’s Chapel at the Newman Center to pray. Well, I tried to pray, but I was mostly thinking about how we had ended up in that moment. I thought of my first night on campus when Evie and two of our (now) best friends showed up at my dorm room. I hadn’t seen them since our mission trip to Christ in the City the previous summer and was shocked that they found me. They convinced me to go with them to some ‘taco truck’ in the pouring rain. We got soaked, ate really good tacos, and stayed up way too late. At the time, I would have never thought that night would lead to some of the best friendships I would ever have. Throughout our first semester of college, these friends and I learned so much about ourselves and about our faith. For one, we learned that iron does in fact sharpen iron. We spent almost every night that first semester going to 10pm Mass. We found our home in the Newman Center. Evie was a social chair and the housekeeper for the rectory, I helped with the Legion of Mary and was an acolyte, and our friends served on the executive board. I don’t say this to show off our involvement, but to point out how much the Newman Center meant to us, and that through giving our time and talents to it, we received so much more. We learned who Jesus is and we learned that our Blessed Mother is always watching over us. That was the reason I was with Evie in that chapel that day–on the Solemnity of the Blessed Virgin Mary–with those two great friends hiding around the corner. After thinking about all of the joys of the past three and a half years, it was time for the surprise. I leaned over to Evie and said “Let’s go over to the nave of the church and see if our friends are over there.” She looked at me confused but said okay. We stood up, approached the Marian altar, and bowed. After our bow, I turned to Evie and I told her that I loved her and I pulled a ring out of my flannel shirt pocket. I got down on one knee and I asked her to marry me. With tears in her eyes she squeaked out a “Yes!” I slipped the ring on her finger and gave her a big hug. I was so happy. Then our friends (with cameras) emerged to greet us. It was important to me, and I knew it was important to Evie, that they would be there for that moment. We all hugged and laughed and cried. It was a moment that Evie and I will never forget. I also only thought it right that Father Matya, our pastor for the last four years, give us a betrothal blessing. I knew that we owed a lot to him and our other priests at the Newman Center. They were always there for us and sacrificed so much to assure the spiritual welfare of all who walk into the Newman Center. They helped us understand that we all have a vocation to which God is calling us– one that we are supposed to live radically! I know that Evie and I can both say that our time at the Newman Center has had a huge impact on our lives. Without our Catholic faith that was nurtured at the Newman Center, we may have never started a great friendship or started dating, and would not be preparing for our wedding (which will be later this month!). The Newman Center means the world to us and we believe in what is happening there. 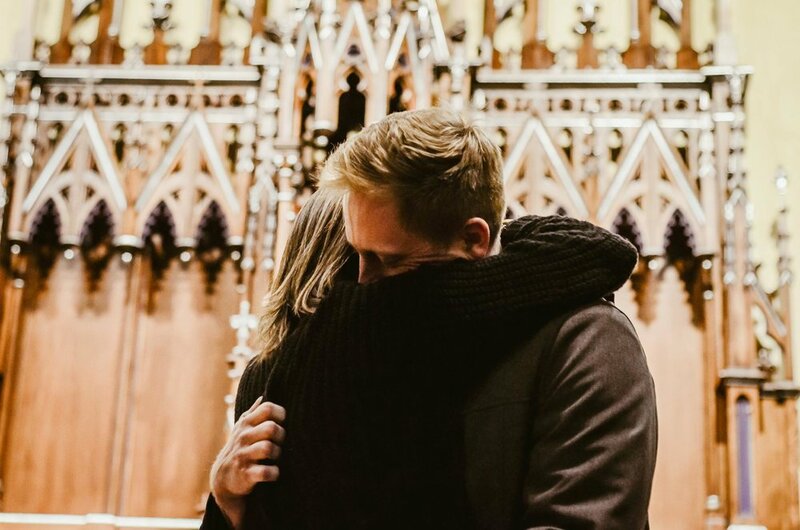 We give credit to the Newman Center for finding our vocation, and we know many others who have found their vocations to the married life, priesthood, and religious life through the ministries there, along with a space for prayer and the sacraments. Please keep the Newman Center and the students there in your prayers. And please pray for us as we be prepare to begin this new chapter in our lives! Our operations and ministries are only possible because of generous people like you. To support students at the Newman Center, prayerfully consider making a donation.